Media captionYellow Vests: Is the symbol spreading across Europe? A diplomatic row between France and Italy has deepened, with France complaining of “unfounded attacks and outlandish claims” by Italian leaders. 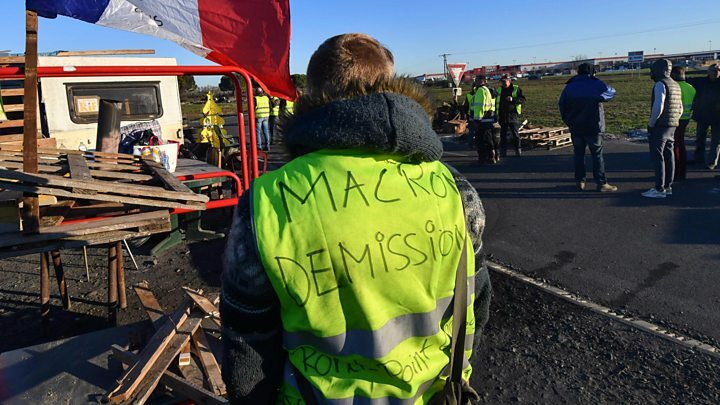 It comes after Italian Deputy PM Luigi Di Maio met French “yellow-vest” protesters near Paris on Tuesday. France warned him not to interfere in the country’s politics. Relations between the two countries – both founding members of the EU – have been tense since Italy’s populist Five Star Movement and right-wing League party formed a coalition government in June 2018. The two governments have clashed over a range of issues, including immigration. What happened with Mr Di Maio? The latest spat began after Mr Di Maio, the leader of Five Star Movement, met leaders of the anti-government “gilets jaunes” protests on Tuesday. He posted a picture of himself on Twitter with yellow-vest leader Christophe Chalençon and members of a yellow-vest list who are standing in elections to the European Parliament in May. “For several months France has been the subject of repeated accusations, unfounded attacks and outlandish claims,” the foreign ministry said on Thursday. Italy’s fellow Deputy PM Matteo Salvini later said he would be happy to hold talks with President Emmanuel Macron. But to “reset” relations he said France had to address “fundamental” issues. He called on Paris to hand over left-wing militants wanted by Italy and to stop returning migrants. He also complained of lengthy French border checks causing traffic jams at the frontier. Mr Di Maio defended his decision to meet the protesters and described the French people as “friends and allies”. “President Macron has on several occasions attacked the Italian government for political reasons in view of the European elections. This has not affected the feeling of friendship that ties our two countries and never will,” he said. Italian PM Giuseppe Conte, speaking on a visit to Beirut, said he hoped the situation could be “cleared up immediately”. “Italy and France’s relationship is rooted in history and cannot be called into question by events,” he said. Mr Salvini launched a direct personal attack on Mr Macron last month, saying he hoped the French people would soon be able to “free themselves of a terrible president”. Why has this row broken out? The French have had enough of months of provocative words and acts emanating from Italy’s two populist leaders. Even Italian diplomats are “completely disoriented by this quarrel and just as surprised” by the positions taken by Italy’s ministers, according to Corriere della Sera columnist Massimo Franco. For France, the reason behind the spat is as clear as a bell. Matteo Salvini of the League and Five Star’s Luigi Di Maio are simply electioneering ahead of the European Parliament elections in May. What has that got to do with France? Neither leader likes the pro-European Emmanuel Macron. For Mr Di Maio, the yellow vests challenging the French establishment are natural bedfellows, while the right-wing interior minister Mr Salvini finds common cause with President Macron’s far-right rival Marine Le Pen. There may be votes in it, but there are big diplomatic risks too. The BBC’s Hugh Schofield in Paris says the row represents a new low in a fast-deteriorating relationship. It is rare for one EU state to recall its ambassador to another. The recalling of any ambassador is usually the step before breaking off full diplomatic relations. In 2016 Greece recalled its envoy to Austria in a row over the migrant crisis. Both Greece and Italy have expressed frustration at the reluctance of other EU states to take quotas of asylum seekers arriving on their shores. In 2017 Hungary recalled its ambassador to the Netherlands over remarks made by the Dutch ambassador in which he drew parallels between Hungary’s government and Islamic State militants. Much of the tension between France and Italy has been about migration. Italy says France has sent migrants back across Italy’s northern border. In January, France summoned Italy’s ambassador after Mr Di Maio said Paris had “never stopped colonising tens of African states”. Also last month, Mr Salvini accused France of harbouring 14 “terrorists” wanted by Italy, after a fugitive ex-militant was extradited from Bolivia. France has also grown impatient with Italy over the building of a €8.6bn (£7.5bn) Lyon to Turin high-speed rail link which the Italian coalition partners cannot agree on. The protesters first took to the streets in November, angered by fuel tax increases. They said the measure hurt those who lived in remote areas of France and who depended on cars. 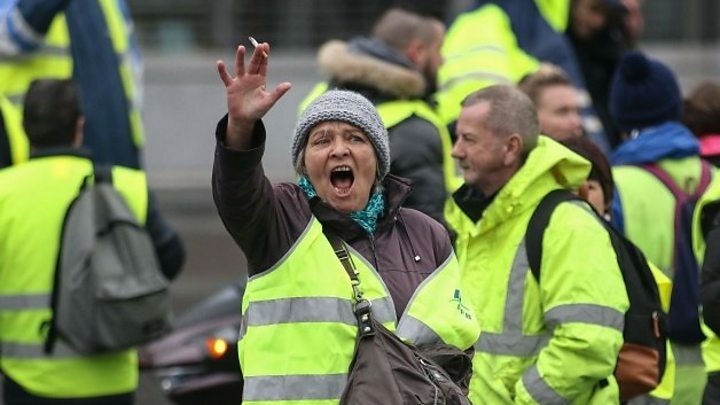 The movement derives its name from the high-visibility yellow vests protesters wear – and which French motorists are required by law to carry in their vehicles. But since their first marches – and the government’s subsequent U-turn on fuel taxes – their demands have expanded to boosting people’s purchasing power and allowing popular referendums. Mr Di Maio has found common cause with the protesters, urging them not to give up and offering them “the support you need”.